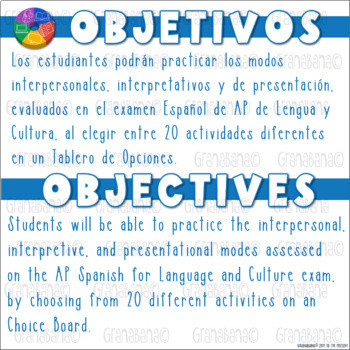 Are you looking to provide your AP Spanish students differentiated preparation and practice in the 4 domains assessed in the AP Spanish Language and Culture Exam? Yes! But it’s too much work and you don't have a lot of time to spare! #Best. PLC. EVER. 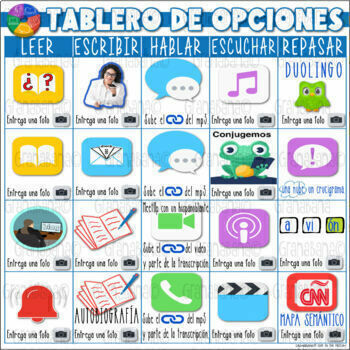 Together, we’ve collected 20 different activities and outside resources in 20minutos.es. Interested? ¡Para Aquí! 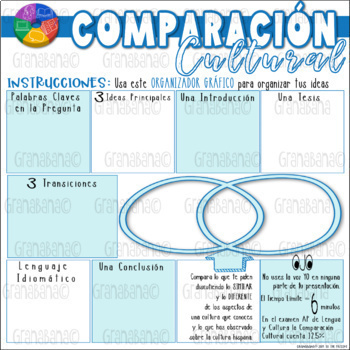 Be the teacher-as-facilitator you aim to be and provide a platform for your students to freely explore, within boundaries, the abilities assessed in the AP Spanish Language and Culture Exam?20minutos.es, a choice-based product provides the focus students need to overcome the intimidating task of preparing for the exam. Here's a blog post, featured on TPT, regarding Choice Boards. THE PERSPECTIVE: We are excited to incorporate student choice in our classrooms. We also believe in allowing students the opportunity to evaluate their own abilities and to decide where they need to improve. THE PRACTICE: We incorporate the idea of asking students to show their L2 love by dedicating a focused 20 minutes in the areas of reading, writing, speaking, listening and mastering essential skills. THE PRODUCT: Students receive an electronic document with live links that will take them to sites where they can practice the skills needed to be successful in the advanced language courses including AP and IB. Click here to follow Granabana to get alerts on new products, updates, freebies and special sales! ♥ Thank you for considering purchasing this product. You work hard and you deserve a break. You have already signed on to TPT, now get credit for future purchases. ♥ If you haven't already done so, please visit us at Granabana for a game-changing strategy freebie!